Open the Start menu and enter “cmd.exe” in the Search box. 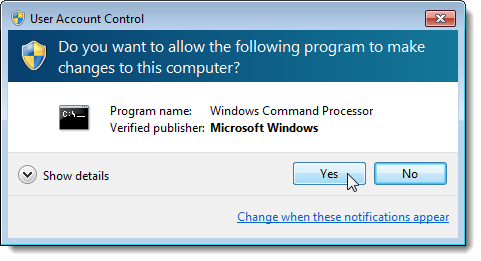 When the results display, right-click on cmd.exe and select Run as administrator from the popup menu. You can find more information about CurrPorts and how to use it on the website listed below. 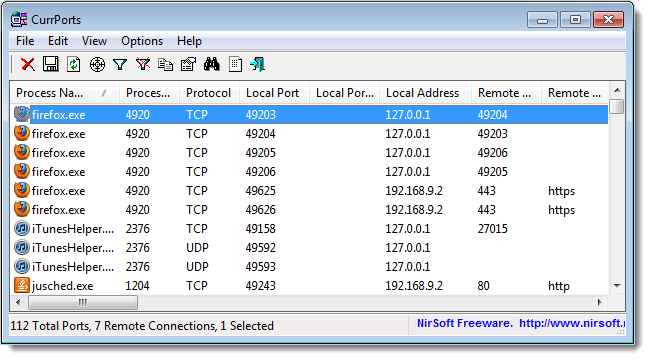 CurrPorts: Monitoring TCP/IP network connections on Windows. If you're concerned about advertisers tracking you across the Web, Mozilla can now help you see exactly who's following you online with a new experimental Firefox add-on called Collusion. The browser extension creates a real-time graph of all the tracking cookies being deposited on your browser as you move around the Web. The add-on can differentiate between behavioral tracking (cookies that record links you click on, what content you view, searches you make on a site, etc.) and other potential tracking cookies. 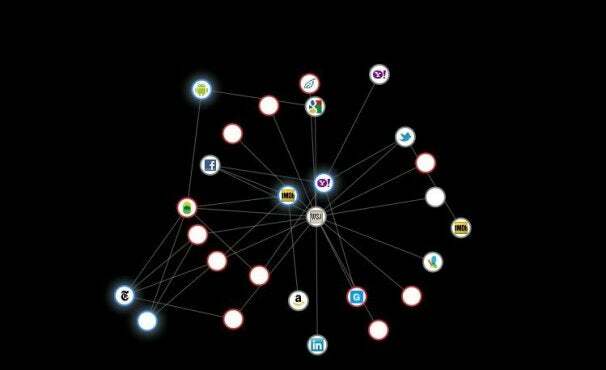 Collusion's graph also makes it easy to see which sites are using the same behavioral tracking advertisers. Collusion was originally developed as an independent project by Mozilla engineer Atul Varma. Mozilla is now developing the add-on with the support of the Ford Foundation. After you've installed Collusion from Mozilla's Firefox add-ons gallery you have to enable it by clicking on Tools>Add-ons>Extensions and then click "Enable" next to Collusion. After that you should see a small red circle on the bottom right of your browser. Now, just start browsing the Web as you normally would. To see the tracking graph build up, click on the Collusion icon in the bottom right of your screen. This will open a separate browser tab with your Collusion graph. Collusion graph after visiting the Android Market, ESPN, IMDb, The New York Times, The Wall Street Journal and Yahoo. The glowing circles represent sites you have visited and each line growing out of that circle is attached to a cookie the site or its advertisers have placed on your browser. 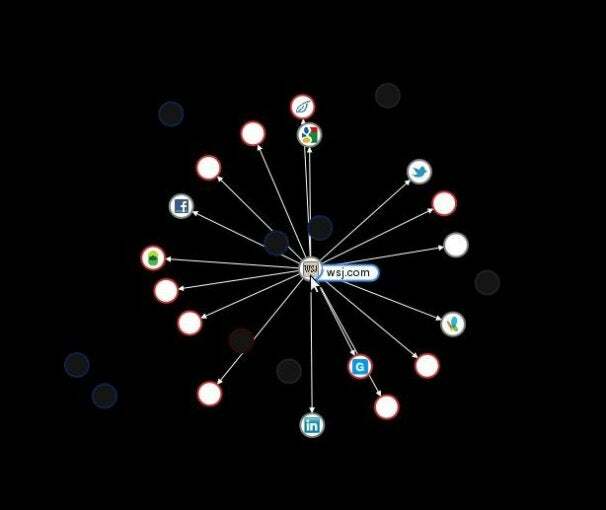 Red circles are behavioral tracking cookies, and gray circles represent non-behavourial tracking cookies. But, Mozilla says, those gray sites may still be tracking you across the Web. In my tests, the gray circles tended to be cookies from social networking sites such as Facebook, MSN, Twitter, LinkedIn, and Twitter. A visit to IMDb, however, deposited a non-behavorial tracking cookie from Amazon on my browser. Tracking cookies connected to The Wall Street Journal. After you've visited about four or five sites, the graph tends to get really confusing and it's hard to tell which advertisers are connected with which sites. To cut down on the confusion just hover over any of the sites you've visited and Collusion will highlight only the cookies connected with that site. You can also do the same for advertisers. If you wanted to see how many of the sites you visit rely on Google's DoubleClick for advertising, you could just hover over the DoubleClick circle. In my case, this shows me that almost all of the sites I previously visited during my short test relied on DoubleClick's cookie. This is helpful information to know since, as Mozilla points out, when the same sites rely on the same tracking cookies, advertisers are able to effectively track you across the sites you visit building up valuable data for market research. Mozilla says that all tracking data Collusion collects is stored locally on your computer and never leaves your possession. You can reset the graph at any time to delete Collusion's database. The add-on also features an export function, but in my tests this feature wasn't functioning properly. Collusion can only show you who's tracking you right now, but future plans for the add-on include the ability to turn off tracking cookies when you don't want to be followed as you browse the Web. Collusion is not a new add on. Still if you haven't seen it at work, you should. It's an eye opener. You never really realize what's going on behind the scenes till you find a tracker at work to show you. None of these sites are doing this for the heck of it. They are accumulating data to sell. Your data. Maybe you don't mind; maybe you're like me and dislike it simply because it's sneaky. Rarely have I ever found something sneaky that was for my benefit. It almost always worked out universally to be against what you stand for. I use Ghostery that stops trackers or you can allow certain sites to be excluded. I was amazed at the amount of data Facebook had on my web surfing activities? But I'll watch this demo now as its all in the name of learning....or self teaching. I've was using ghosty as well, they just changed the privacy conditions and myself I wasn't liking what they were keeping for themselves. I wasn't aware of that , so what are you using now Bobo? 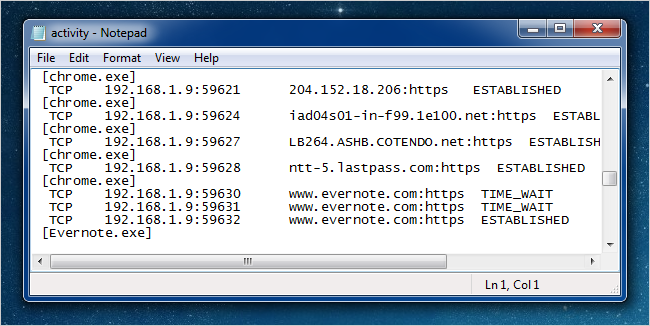 Right now just AVG do not track. They just changed it this past week, I think they were going to track and record what sites you go to. I'm the type that hate people tracking my movements for their personal gain. I don't travel to questionable sites, I have no problem telling anyone where I go I just don't care for people being sneaky about it. I very seldom read privacy policies and these companies know that and will sneak things like that in. One thing I've been doing for years is hitting a blank or google home page before I use one of my bookmarks, that way if the place I just left was tracking where I was going to they would come up blank.